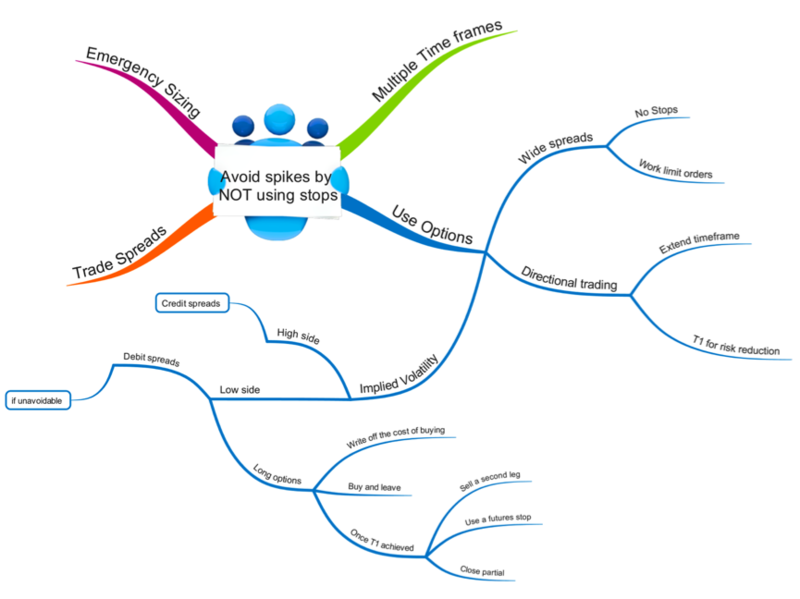 Avoid spikes by NOT using stops! Previously we spoke about the markets tendency these days to throw spikes out all over the place, catching the stops of unsuspecting traders, before making the real moves. Normally all traders should use a stop on every position in order to protect themselves against losses in excess of that budgeted for. 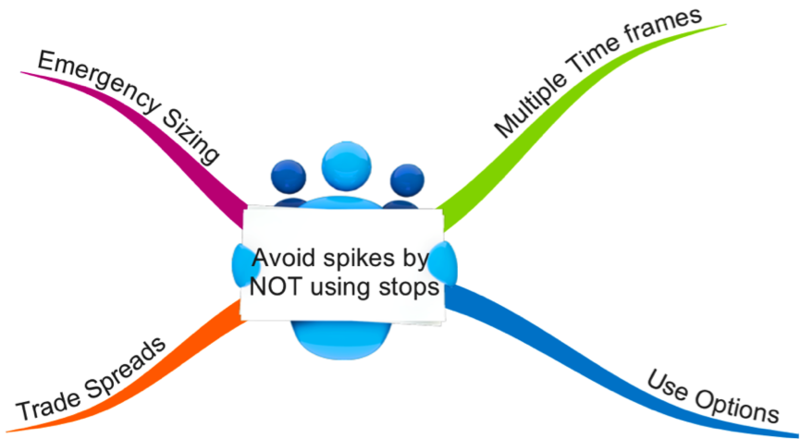 However in an environment such as we are witnessing today using stops is like playing a game of Russian roulette – the longer you are in the market the greater the chance of becoming impaled on a spike. Therefore we must respond to this new threat by making tactical changes to our trading. This does not mean throwing away our existing models or strategies, but simply by implementing them in slightly different ways in order to capture the same movement indicated by our models, while sidestepping today’s spike threat. There are several different ways of trading larger timeframes without using stops but still maintaining a cast iron grip on our trade risk. In this article I want to explore one of those tactics which is using options. This is NOT options trading! I know many traders are fearful of using options and for very good reasons. But what we are going to do is to use a very simple strategy and use that purely as a means of implementing our own longer term trading signals. So we don’t need to worry ourselves with most of the mathematics, the complex scenarios, trading volatility etc that option traders generally have to be proficient with. You can pick up numerous different books on option trading and very quickly conclude that they are such a minefield it is safest to stay away from them. In many ways this is true, and I make no secret of the fact that I have not traded options seriously since the 1990s. But the business of “option trading” is completely different to using a simple option strategy to implement futures trades. Futures trading is a directional strategy whereas option trading may not be. Option traders trade options for the sake of trading options, we do not! We treat our use of options has a very simple means of implementing directional futures positions. The next thing we need to consider is our time frame. What I’m discussing here is a great way of trading multi-day to multi-week position trades taken for example off of daily charts. It is the longer held positions that are most susceptible to spike risk as the longer you are in the market the more time there is for you to get unlucky and catch one! In fact by using options to implement our futures signals we will often be able to hold onto our positions longer than we would trading the futures outright. For example we can sit through reports without being forced out for fear of getting stuck in locked limit moves! So to some extent we will be extending our timeframe by using this tactic in many cases. We will also use our first target to signal to us that it is time to reduce risk in the open position so that we can then hold it for the longer term. Unlike futures which tend to have very tight spreads between the bid and offer, options often have wide spreads so anyone new to option trading needs to be aware of this and how we deal with it. First of all we do not use stops with options. Entering or exiting on a stop with an option will almost certainly lead to huge slippage as well as the loss of the bid ask spread, which can be as much as 10% of the option value to start with! Therefore we always work limit orders to enter and exit option positions. E.G. of the quoted price is 30-33, don’t pay 33. Place a bid at 31 or 30.5 or something and try to always work orders. The next thing we need to consider in a very general way is what the implied volatility is in the commodity that we are looking to trade. Now don’t glaze over here and worry about this. I’m only talking very generally about whether volatility is high or low. Nothing more complex than that. When volatilities are high we are going to lean toward strategies that bring in premium, i.e. we want to be net premium sellers so we would use vertical credit spreads. But as volatilities are currently low in just about all markets we are interested in we do the opposite today. We want to be net premium buyers because options are relatively cheap! And as options are cheap we are going to look to either be outright buyers of options or buyers of vertical debit spreads. So for the purpose of illustration, let us assume our normal futures strategy gives us a buy signal in a particular market. Instead of buying the futures and placing a stop somewhere below our entry, we’re going to look to buy call options if possible. Or if they’re too expensive we will look to buy a call spread. In both cases we will be buying the call option with the strike price that is at or close to the current market price and with a minimum of 35 days to expiry, ideally 45 to 60 days left until expiry. Do not buy options [ismember]with less than 30 days to expiry or else time decay will rapidly offset the progress any position makes by moving in the right direction. This is the mistake many novice option traders make. Also beware of way out of the money options. They can work but rely too much on a rapid price movement. There is great temptation to buy options that are too close to expiry and too far out of the money – because they are cheap! If you have confidence in your signal there is nothing wrong with paying up to give yourself sufficient time and even to buy options that are a small way in the money. Longer dated, in the money options have real advantages, which is probably why no one ever trades them! If the cost of at the money call options with sufficient days can be accommodated by our budgeted risk per trade, then that is the position we want. A maximum loss if the trade was a complete failure would be the money we have spent to buy that call option or options. We accept that risk and are prepared to stick with the position and see how the trade plays out. Now when the market makes a huge spike against our position that would previously have stopped out our futures position for a loss, we just sit back and ignore it. 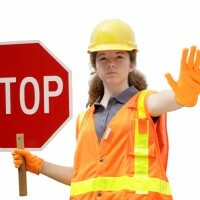 We have no stop and cannot be taken out of a winning trade by the spike! If and only if the cost of the call option is too expensive for our account, then we will sell another call option a few strikes further out of the money in order to recover some of the cost of the at the money option we are buying. We only do this if it is unavoidable as a debit spread is less attractive than outright calls. However in some of the larger markets where at the money options still cost several thousand dollars using this debit spread is the only way to participate in the market within a budget. So for example let’s say the option that we want to buy costs $2000. We then sell one further out of the money for say $1000, so our net cost for establishing the position is only $1000. In the markets with smaller contract sizes we may be able to buy one or even more at the money options for our $1000 budget in which case we buy the calls outright and forget about selling the second leg. So if we have bought our call options the next stage is to wait until our first target on the trade is reached. This would be the same target we are using if we were to be trading the futures market in the normal way. Once this target is reached we then look to reduce or eliminate the risk in the open position, again just as we would if we were trading the futures outright. We will reduce risk in one of three possible ways depending on the circumstances of the trade and the value of the options at the time our first target is reached. The second thing we might do in order to recover some of the cost of our initial investment would be to sell some other call options NOW rather than at the time when the position was opened. Opening the second leg once the market has already moved our way significantly is much preferable to having to open the spread at the beginning. Now we can recover a significant amount of money while retaining a very high probability of making money with the position irrespective of what happens next. There will be a big gap between the strike price of our long and short options. As an example let us say we bought gold call options with the strike price of 1650 and the market has now moved up to 1720 which we regard as our first target on this long-term position. If those call options cost us $30 initially we can place a sell stop in the futures at a price of 1680 and our position is now cost neutral. This scenario insures that we still have the maximum upside potential if the trade now continues to move to second and third targets over the coming days and weeks, as we have not sold any additional calls and have therefore not limited the upside potential of the trade. If the market collapses and we end up short a futures contract we now have a neutral position (that in theory we might hold until expiry before unwinding) ensuring that the failed trade still has cost us nothing. The one thing we do not do unless it is totally unavoidable would be to use a stop on the long call option itself for the reasons discussed above. So there are a few ways to initiate and manage very simple option positions to implement our futures trades without having to run the risk of working stops in the market and becoming targets for those regular spikes that tend to proceed decent moves these days. If you are new to options then I would recommend getting a very simple book or guide on the basics of options. Avoid the big comprehensive books and complete courses on trading options and focus on the very basics only. Remember we are not looking here to be option experts. We just want to do a few very simple things with options as a means of tactically implementing directional futures signals without having to open futures positions which by definition mean we have to stand in the firing line of these spikes by using a stop. I will leave you to research this further and hope this article will have inspired you to look at the first of several ways that you can trade futures without using stops!